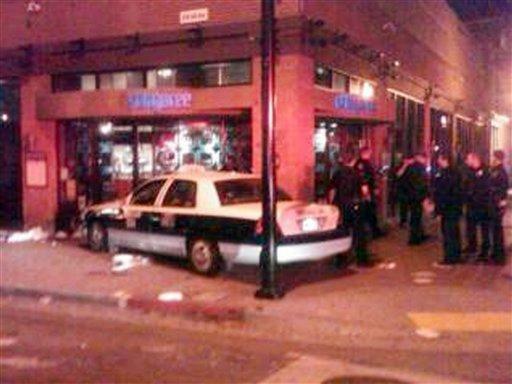 SAN DIEGO (AP) - A taxi driver who may have passed out or fallen asleep plowed slowly through a crowd on a sidewalk in a popular restaurant and nightclub zone early Saturday, severing the leg of one woman and injuring more than two dozen other people before some in the crowd beat him, police said. The crash occurred about 2 a.m. in the heart of the busy Gaslamp District as revelers were heading home, according to police Sgt. Ray Battrick. Witnesses said the cab was traveling around 15 miles an hour. The 48-year-old cab driver sustained a broken nose after being beaten by people in the crowd, who also smashed windows on the taxi, Battrick said. Security guards from a nearby nightclub intervened and detained the driver until police arrived, and he was transported to a hospital. Police detectives were interviewing the driver, whose name has not been released. The crash did not appear to be intentional, and alcohol was not involved, Officer Michael Stirk said. "We're trying to determine what exactly caused the accident," police Lt. Rick O'Hanlon said. "There have been some reports that he passed out." Police said 25 people were injured. All but two were taken to area hospitals, and all were expected to survive. A 42-year-old woman was pinned against a wall by the cab and had her leg severed, police said. Officials at UCSD Medical Center and Scripps Hospital system confirmed treating victims from the collision. They would not disclose patients' conditions or identities, citing privacy laws.